In making a list of potential animal business ventures, most people think of traditional options such as pet sitting, dog walking, grooming, boarding, or training. While these can be great options for those looking to enter the industry, there are many more possibilities to consider (including some truly oddball ideas). Here are ten of the most unusual animal business ideas for entrepreneurs seeking something different. In recent years, particularly in large metropolitan areas, it has become trendy to dye pet fur into unusual colors and patterns. Many different colors and patterns have popped up in the pet population including pastels, stripes, and spots. This can be an interesting sideline for a pet groomer that will create a buzz in the local pet community. There are also some colorists working on movie sets, heightening or changing the coloration of animal actors. Some enterprising goat owners rent out their goats for eco-friendly mowing and weed control purposes. 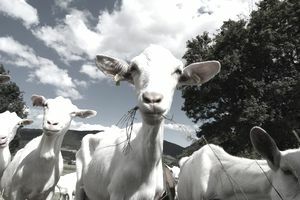 A small herd of goats can mow a pasture in a few days, and they are great for difficult areas like hills and uneven terrain. Major companies like Yahoo and Google use goat mowing services on their business campuses, and Amazon jumped on the trend in the spring of 2015 by offering goat grazing rentals on the home services section of the website. Goose control services are growing in popularity, and they are often used by golf courses and resorts to minimize the nuisance issues associated with a resident flock (namely goose droppings). Goose control businesses encourage geese to relocate through a combination of herding dogs, repellents, boats, and other measures that make the protected facility undesirable. These businesses must be careful, however, to operate within federal regulations regarding geese and other waterfowl. Cat cafes have become very popular in Japan, and in the United States, you can now find them in several states including California and New York. Cat cafes usually charge an admission fee for cat access and also sell traditional cafe products such as coffee and baked goods. Some cat cafes feature rescue cats from local shelters that are available for adoption. Pet taxi services have grown in popularity in recent years. This option is ideal for busy owners who need help getting their pets to appointments. This business also has an extremely low start-up cost, making it very accessible for those looking to enter the pet service market. Pet psychics and animal communicators may be a little “out there” as a far as a career choice, but some owners swear by their pet psychic. A belief in telepathic communication is a must for this business. There are several providers of pet prosthetics and cosmetic implants in the current pet product market. Our favorite oddball product is “Neuticals,” the surgically implanted prosthetic testicles for neutered dogs. The company claims to have sold more than 500,000 implants. Pooper scooper services have shown a sharp uptick in popularity. There are even several major franchises that offer aspiring business owners the chance to become part of an established team (such as Pet Butler and DoodyCalls). Owners are increasingly willing to spend money on their pets, and some pay top dollar to board their pets in luxury “hotel rooms” that have a human bed, television, and other amenities. These hotels also tend to feature webcams so owners can view their pets at any time while they travel. A growing segment of the pet services market is devoted to end-of-life services such as cremation, pet funerals, pet cemeteries, pet memorials, or taxidermy. There are many potential services that could be offered individually or packaged together in a single business entity. USA Today mentioned that there were only a few pet funeral and cemetery businesses in the early 2000s, but that number had ballooned to more than 700 such businesses in 2012.